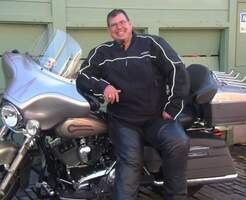 Provide comfort for the family of Douglas Dugin with a meaningful gesture of sympathy. March 14th, the day after his 52nd birthday, Doug went home to be with God. He was born in Pacoima, CA to Roberta (Gibson) Dugin and Erwin Dugin. He leaves behind his wife, Barb; daughter Chelsea Dugin; four step-daughters: Serina, Ashley, Brittney, and Cristey; three grandsons: Grayson, Charlie, and Oliver, whom he loved greatly; two brothers: Mike, of Oak Harbor, Washington, and Edward Dugin, in Arizona; and three nephews: Jacob, Ben, and Nicholas. Doug had a career working with Boeing and later retired. He was then able to pursue his passions of metal working and spending time with his family. He had a love of hunting and fishing which he enjoyed most with Mike in Alaska. Those who knew him would say that he would light up a room with his kind, charismatic personality. Whether he was turning horse shoes into beautiful works of art or having snowball fights with his 9-year-old grandson, Doug did everything with all of his heart. He was happiest on the ocean or in his “man cave” working tirelessly on some new project to provide for his family. There was never a doubt that he would do anything for those he loved, and it wasn't uncommon for him to lend a helping hand to a stranger in need. Doug believed in family. He believed in “having fun”, and nightly prayers. He was the deep-fried turkey man, the creator of the best bonfires, and someone who never failed to say, “God bless, I love you”. Doug will be greatly missed by all those who knew him and were blessed to call him a friend. A Celebration of Life will be held in Doug’s name at The Bridge Christian Fellowship, Oak Harbor, WA on Saturday, March 30, 2019 at 3pm. To send flowers in memory of Douglas Scott Dugin, please visit our Heartfelt Sympathies Store.